(Blogger's Note: On Sunday morning, November 2 I was sitting at the airport in Atlanta, Georgia waiting for my 11:10 am flight to depart for Houston. I then saw 27-year-old super model Toccara Jones pass by my table heading to her plane and I kindly ask if I could get a quick interview with her about what this year's Presidential race means to her. Below is that interview! Brother Jesse (BJ): What is your vantage point on this year's race for the Presidency? I am so glad people are out voting and that we are doing it early with such a huge turnout. That was Friday and then on Saturday (Nov. 1) there was like 2700 people that came out. So I'm happy we came out early because come Tuesday (Nov. 4) we may not have enough time with so many people coming out and then many of us would be upset because they may cut us off in the line. TJ: Because I have listened to Obama in the debates and interviews and he relates so well to the people to the point that I feel like I can reach out and touch him. He is able to break things down for every one to understand the issues. Usually when people are running for President or other offices, they can tend to get so political that you don't understand the language, what's going on, or what that candidate is going to do for you. But Obama puts it out there so clearly that even young people can understand what he stands for and what he represents. I think it is so dear to people that he has brought things down for everyone to understand, feel and relate to. No fancy language, just straight to the point. That's what I love about Obama. TJ: My advice to the youth is to be determined and dream big. Like Obama says, 'we're looking for change'. So we have to change the way we think. We have to believe in ourselves. We grow up in disbelief so much that we don't believe when someone tells us this or that about ourselves that may be of good. 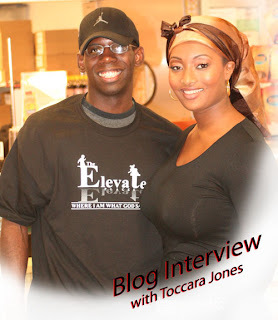 I really like Toccara's spirit and I enjoyed this brief interview. Thanks Brother Jesse.